The Mini Mag-Lite M3A with your Full-color Logo permanently placed on the handle. Only one supplier has the ability to put a color imprint on a Maglite flashlight. 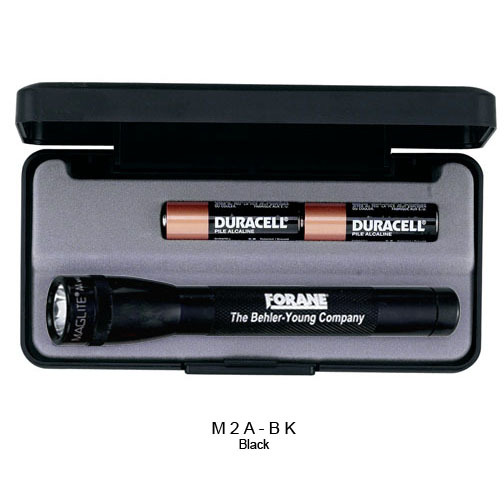 M3A Mini Mag-Lite® Flashlight with Your Full-Color Logo! • Flashlight, 5" in length. 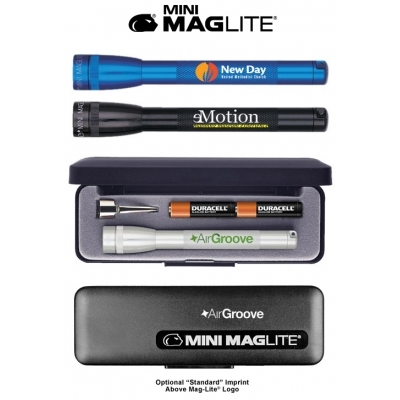 • Includes pocket clip, 2-AAA battery. • Converts to free standing candle mode. Pricing Includes: Full color printing using four-color process colors (cyan, magenta, yellow and black) on barrel. Additional art charges will apply to convert colors. Exact PMS matches are not possible. Neon and metallics are not available. Additional Location Engraving: Add $0.45 per item, plus setup, for additional engraving location on opposite side of barrel. Gift Box Imprint: "Standard" Imprint location is ABOVE Mag-Lite logo (Imprint area: 5-1/4"W x 5/8"H, "Alternate" Imprint location is BELOW or to the LEFT of Mag-Lite logo (Imprint area: 1-1/2"W x 1-1/8"H). SPOT COLOR: $0.25 each piece, plus setup. FULL COLOR DIGITAL: Contact us for details.